The Huawei MediaPad M3 was one of the big highlights of IFA 2016 this year. There are not a lot of high-end 8 inch tablets out there but the M3 is definitely one of them. With this one we get a fast processor, a high resolution display, a metal body and good speakers. But how good is the MediaPad M3 really? That’s what we want to find out with this review. Compared to last year’s MediaPad M2 8.0 the design of the MediaPad M3 is a lot better. The full body is made out of metal now and feels very high-end, similar to the MateBook. Only on the top is a small plastic cover which covers the antennas. There’s an 8 megapixel camera on the back as well. With 7.3mm the M3 is not the thinnest tablet out there, since the Galaxy Tab S2 is only 5.6mm thin. But while with Samsung only the bezel is made out of aluminum the M3 has a body almost completely made out of metal. It’s relatively light with 310g. Above the 8.4 inch display sits a front camera with a resolution of 8 megapixel as well. The bezel around the display is completely white. On the bottom Huawei integrated a fingerprint reader which is not only used to unlock the device but can also replace the three typical android buttons for home, back and multitasking using gestures. The fingerprint scanner works like the ones on Huawei’s smartphones. On the sides are a power button, volume control and a MicroSD card slot. There’s also a microUSB port and two speakers which are developed together with Harman Kardon. The IPS Display is 8.4 inches and has a very high resolution with 2560 x 1600 which makes it one of the tablets with very high 359ppi pixel densities out there. Not only the resolution is high, but the display is over all one of the best ones. It’s quite bright, colors look very nice and the viewing angles are very good. It’s a lot of fun to watch movies, TV shows or YouTube videos on it. Unlike a lot of it’s competitors the display has an aspect ratio of 16:10 and not 4:3 which makes it better to watch movies. Compared to the ASUS ZenPad 3 8.0 the display is a lot better in my opinion as well. It’s a bit sad though that Huawei is not supporting a stylus like with the MediaPad M2 10.0. Inside runs a HiSilicon Kirin 950 octa core processor that we know already from the Mate 8 smartphone. Four of those eight cores are clocked at 2.3GHz while the other four run with 1.8GHz. The chip is supported by 4GB RAM and an internal storage of 32GB to 64GB – depending on the version you get. 4GB RAM are a standard though which is very nice. The Huawei MediaPad M3 is the fastest android tablet I reviewed recently, that is supported by a couple of benchmarks. In Geekbench 4 it got 1750 points in the single core test and 5300 points in the multi core test. On AnTuTu the M3 gets a result of 93900 points. So in those benchmarks it’s faster than the Samsung Galaxy Tab S2 or ASUS ZenPad 3S 10. I played a couple of games with this tablet and most games like Modern Combat 5 and Dead Trigger 2 run without any problems very smoothly. That’s not always the case for Asphalt 8 Airborne though. I could play it very nicely but if you look closely you might notice some minor lags while playing. If you are used to the most high end smartphones you might notice it, otherwise you probably wouldn’t. That’s what happened to me at the beginning. All other apps I tried run very smoothly without any lags. On the MediaPad M3 runs Android 6.0 Marshmallow which is topped with the EMUI 4.1, the own interface from Huawei. With this Emotion UI the interface is customized quite a bit. I like vanilla Android more but the EMUI 4.1 looks actually quite nice and is very usable. Huawei is giving us a couple of features that are not a standard of Marshmallow. There’s a multi window mode for example which lets you open and use two apps side by side. You can filter out blue tones as well for a better sleep and use gestures with the fingerprint scanner. With the LTE version of the M3 you’re getting a phone app as well. So it is actually possible to replace a smartphone with this. That’s the case with most tablets from Huawei for years now. Together with the Emotion UI are a lot of apps preinstalled. Most of them can be deinstalled very easily but that does not work with apps like the calendar which come from Huawei directly. Apparently Microsoft and the Chinese manufacture have a deal as well because Office apps are preinstalled. Inside the MediaPad M3 sits a battery with a capacity of 5100mAh which sounds like a lot. Acording to Huawei it should have a runtime of up to 11 hours. In my battery test the result wasn’t 11 hours but 10 hours and 30 minutes. So while it’s not the tablet with the longest battery life out there the results are still pretty good. I’m always doing the same battery test by watching a 720p video over and over again with brightnes set to 50%, activated WiFi, deactivated audio and no apps like Facebook are installed. With a couple of E-Mails coming in in between a runtime of over 10 hours is pretty good. Huaweis MediaPad M3 is fitted with two speakers that are developed together with Harman Kardon and should have a nice audio quality. That is actually the case. While you still can’t compare tablet speakers with a high end audio system, the sound is very nice indeed. I enjoyed it a lot to listen to music with it. I compared the speakers of the M3 to those of the ZenPad 3 8.0 and Amazon Fire HD 8 and compared to those the M3 is a lot better. It has very loud speakers and a nice bass. They’re loud enough to fill a big room. The Huawei MediaPad M3 is one of the best tablets I reviewed this year. The build quality is very high end, the performance is very fast and the display has a nice high resolution. Thanks to more premium features like a fingerprint scanner there’s not much I would change. If you’re willing to spend around 300$ than I’m quite sure you’ll enjoy the MediaPad M3. 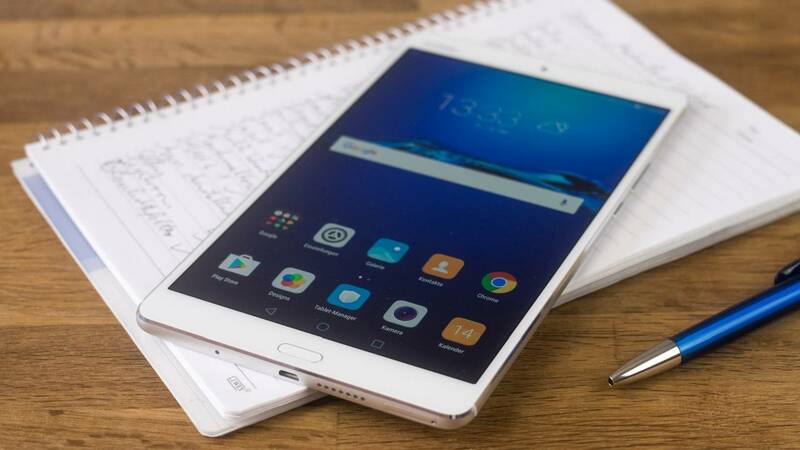 Huawei MediaPad M3 Review:The Huawei MediaPad M3 is one of the best 8-inch tablets out there. It offers great performance at an affordable price, a very high resolution display and a good built quality. If you want as much value for your money as possible, this is the tablet to get.